Property owning women and widows had been allowed to vote in some local elections, but that ended in 1835. The Chartist Movement was a large-scale demand for suffrage—but it meant manhood suffrage. Upper-class women could exert a little backstage political influence in high society. However, in divorce cases, rich women lost control of their children. The Infant Custody Act of 1839, passed by Parliament after years of lobbying by a woman who had lost her children, vested the custody of children under 7 in divorce cases with the mother. Bullough argues that prostitution in 18th-century Britain was a convenience to men of all social statuses, and economic necessity for many poor women, and was tolerated by society. The evangelical movement of the nineteenth century denounced the prostitutes and their clients as sinners, and announced society for tolerating it. Prostitution, according to the values of the Victorian middle-class, was a horrible evil, for the young women, for the men, and for all of society. Parliament in the 1860s in the Contagious Diseases Acts ("CD") adopted the French system of licensed prostitution. The "regulationist policy" was to isolate, segregate, and control prostitution. The main goal was to protect working men, soldiers and sailors near ports and army bases from catching venereal disease. Young women officially became prostitutes and were trapped for life in the system. After a nationwide crusade led by Josephine Butler and the Ladies National Association for the Repeal of the Contagious Diseases Acts, Parliament repealed the acts and ended legalised prostitution. Butler became a sort of saviour to the girls she helped free. The age of consent for young women was raised from 12 to 16, undercutting the supply of young prostitutes who were in highest demand. The new moral code meant that respectable men dared not be caught. ↑ Ben Griffin, . "Class, Gender, and Liberalism in Parliament, 1868–1882: The Case of the Married Women's Property Acts." Historical Journal (2003) 46#1 pp: 59-87. ↑ Vern L. Bullough, "Prostitution and Reform in Eighteenth-Century England," Eighteenth-Century Life (1985) 9#3 pp 61-74. ↑ F. B. Smith, "The Contagious Diseases Acts Reconsidered," Social History of Medicine (1990) 3#2 pp: 197–215. ↑ David A. Coppock, "Respectability as a prerequisite of moral character: the social and occupational mobility of pupil teachers in the late nineteenth and early twentieth centuries." History of Education (1997) 26#2 pp: 165-186. 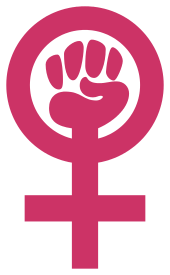 ↑ Patricia Owen, "'Who would be free, herself must strike the blow': The National Union of Women Teachers, equal pay, and women within the teaching profession." History of Education (1988) 17#1 pp: 83-99. ↑ Maria Tamboukou, "Of other spaces: women's colleges at the turn of the nineteenth century in the UK," Gender, Place and Culture: A Journal of Feminist Geography (2000) 7#3 pp: 247-263. ↑ June Purvis (2003). Emmeline Pankhurst: A Biography. Routledge. p. 45. ↑ Christina Broom, and Diane Atkinson, Mrs Broom's suffragette photographs (Nishen, 1988). 1 2 David J. Mitchell, The fighting Pankhursts: a study in tenacity (1967). ↑ Langhamer, Claire (2000). Women's Leisure in England, 1920-1960. Manchester University Press. p. 53. ↑ Representation of the People Act 1918 Archived June 9, 2008, at the Wayback Machine. 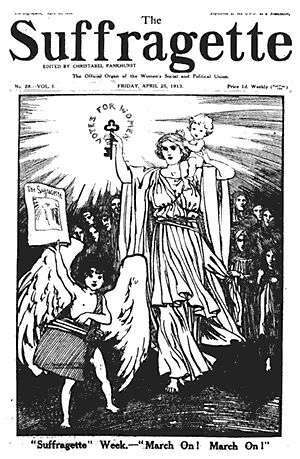 ↑ James J. Smyth, Labour in Glasgow, 1896-1936: socialism, suffrage, sectarianism (2000). ↑ Tiffany K. Wayne (2011). Feminist Writings from Ancient Times to the Modern World: A Global Sourcebook and History. ABC-CLIO. pp. 484–85. ↑ Margaret Walters (2005). Feminism: A Very Short Introduction. Oxford UP. p. 116. ↑ Besant, Annie. The Law of Population: Its consequences and its bearing upon human conduct and morals. London: Freethought Publishing, 1877. ↑ "Sisterhood and After: first oral history archive of the UK Women's Liberation Movement". Reframe.sussex.ac.uk. 2013-03-08. Retrieved 2015-09-26. ↑ Mary Lyndon Shanley, "Suffrage, protective labor legislation, and Married Women's Property Laws in England." Signs (1986) pp: 62-77 in JSTOR. ↑ Mayall, Laura E. Nym (July 2000). "Defining Militancy: Radical Protest, the Constitutional Idiom, and Women's Suffrage in Britain, 1908-1909". The Journal of British Studies. 39 (3): 350. doi:10.1086/386223. ↑ Leslie Parker Hume, The National Union of Women's Suffrage Societies, 1897-1914 (1979).